Cambridge, MA USA (March 17, 2011) – SunMaxx Solar is proud to announce the successful installation of SunMaxx TitanPower Plus-SU2 flat plate collectors at Harvard University’s Harvard Yard. 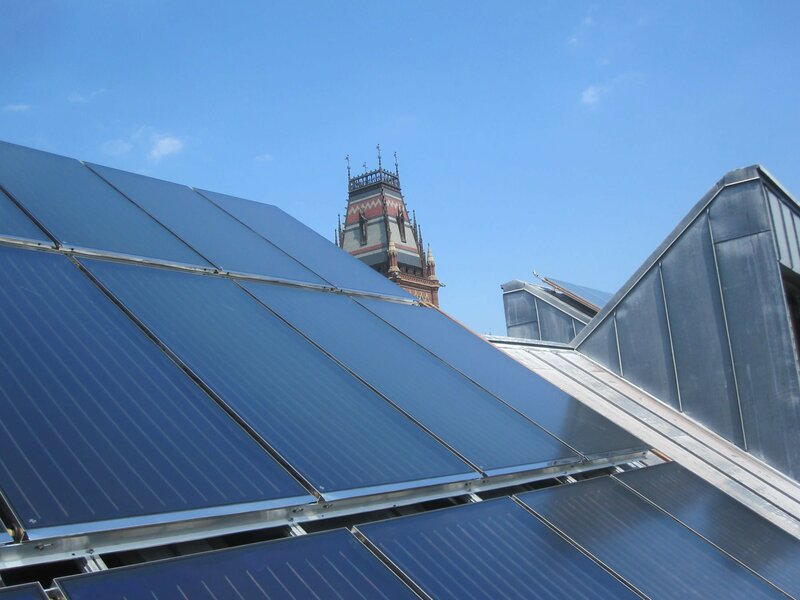 The solar system was built atop the Canaday Hall building as part of a larger system that provides hot water to all of the buildings within Harvard Yard. 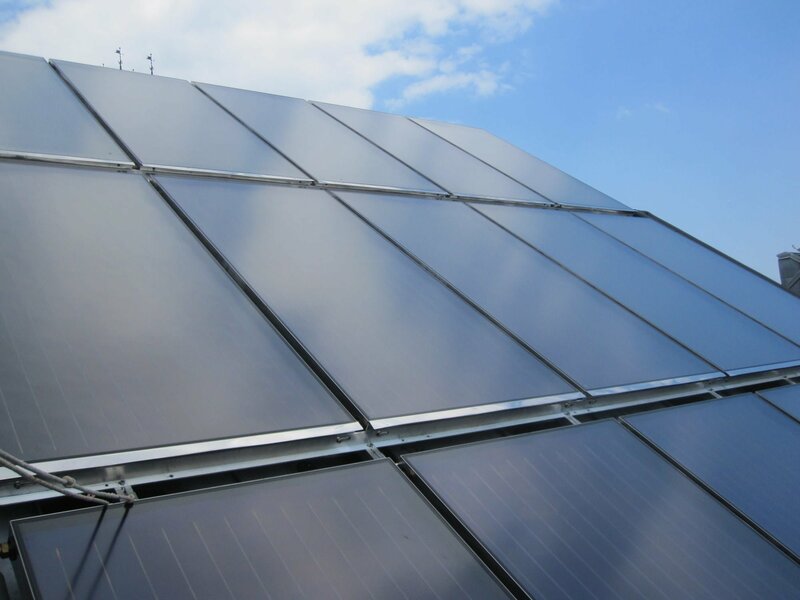 Installed,engineered and designed by the SunMaxx Solar authorized installer LittleFoot Energy Corporation, who served as the prime contractor on the project, the collector array will provide approximately 773 MMBTU/year, which is an estimated 30% solar fraction. The more than 3,200 square feet of SunMaxx TitanPower Plus-SU2 flat plate collectors atop the three buildings of Canaday Hall is part of a solar thermal and steam tunnel heat-recovery project that won the New England Association of Energy Engineers best renewable energy thermal project for 2010. This hybrid heating system also collects exhaust heat from a steam tunnel under the dormitory. The heat captured from the flat plate collectors and the steam tunnel runs through a system of glycol-filled pipes, which feeds into a 1,000 gallon buffer tank in Canaday’s basement. This preheats the water in the buffer tank to 130 degrees before the water is pumped to the buildings around Harvard Yard. and recently established an aggressive sustainability objective to reduce greenhouse gas (GHG) emissions and overall carbon footprint. The stated goal is to reduce GHG emissions 30% by 2016, a challenging objective for any organization. SunMaxx Solar congratulates Harvard University on being a forerunner in not only creating a more energy efficient system through their use of solar powered systems, but also in educating the surrounding community about the benefits of clean, renewable energy. LittleFoot Energy Corporation is a Massachusetts based company founded with the mission of helping companies and building owners prioritize, monetize, fund, and implement a broad range of energy projects that reduce dependency on fossil fuels, increase the bottom line, and position for a strengthened competitive future. LittleFoot Energy specializes in heating, cooling and electricity projects that combine energy efficiency measures with renewable energy sources- creating hybrid systems that save energy and reduce carbon footprint. For more information, please visit SunMaxx Solar online at: www.sunmaxxsolar.com, LittleFoot Energy Corporation online at: www.littlefootinc.com, and Harvard University online at www.harvard.edu . You can also contact a SunMaxx Solar thermal specialist at 1.877.786.6299. The Harvard Gazette did a great write-up on this Harvard Solar Hot Water Project Here: Harvard Gazette Solar Story.